ANKARA, Turkey — Two bombs went off at a peace rally in the Turkish capital of Ankara on Saturday, killing at least 95 people and wounding 246 in the deadliest attacks in Turkey in years. The rally was organized by Kurdish and leftist groups to demand an end to the resurgent clashes between Turkey and Kurdish rebel fighters. Hundreds had traveled from around the country to take part in the peace march. A video from Turkey’s Dogan news agency showed a line of protesters dancing and chanting arm in arm at the rally outside Ankara’s train station before they were hit by a powerful explosion. The two blasts took place about 50 meters (54 yards) apart, within seconds of each other. Seconds after the blast, Ismet stumbled around in confusion, going from body to body to see if anyone was still alive. He frantically searched for his wife and child, both of whom he found unharmed in the carnage. Following the explosions, police doused people scrambling to help the wounded with tear gas, several survivors told The WorldPost. There was no immediate claim of responsibility for the attacks. Prime Minister Ahmet Davutoglu told a news conference there were “strong signs” the attacks had been carried out by suicide bombers, and indicated that the Islamic State militant group or Kurdish separatists could be to blame. Photos and videos from the scene showed streets scattered with dead bodies and wounded blast victims, while tear gas billowed in the background. People used the flags and banners brought to the rally to bandage up victims’ wounds, or as makeshift stretchers, according to a video by The Associated Press. Police later prevented journalists from accessing the blast site. A video posted by an activist group called Student Collectives appeared to show protesters breaking up a police barricade that was preventing ambulances from passing. SOPHIA JONES/WORLDPOSTMen in full protective gear walk behind police tape, inspecting thedamage after the morning’s twin bombings. Police have barred civilians and journalists from walking near the blast site. 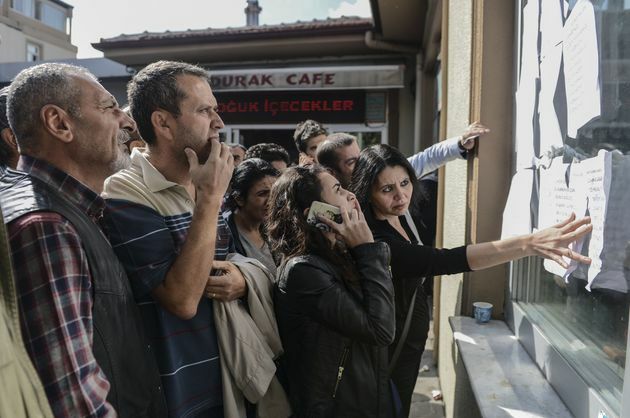 Protests erupted outside hospitals around Ankara, as survivors and the victims’ relatives expressed outrage at the government’s response to the blasts. Some demonstrators chanted “Murderer Erdogan!” referring to Turkish President Recep Tayyip Erdogan, according to the AP. 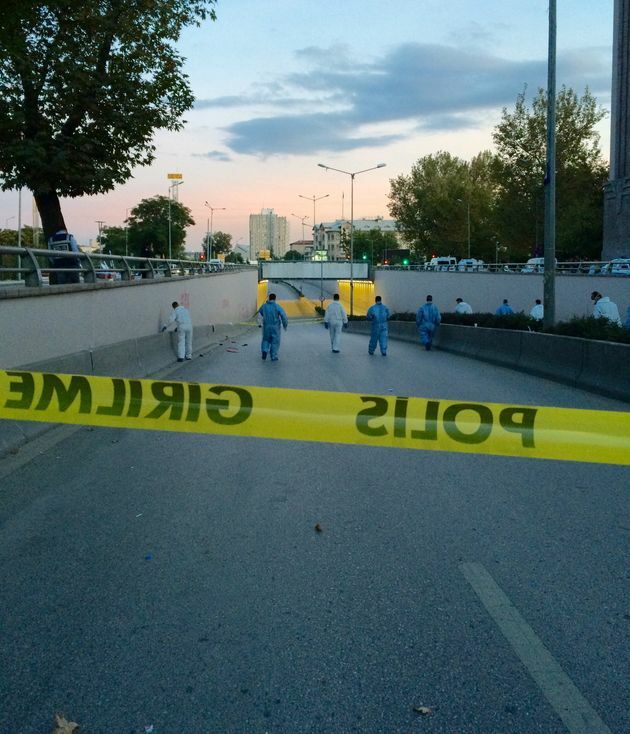 Hundreds of people gathered outside the entrance of the Ankara Numune hospital, demanding information on the condition of their loved ones. Many were not allowed to go inside. “Sister, he’s gone!” a middle-aged woman cried outside of the emergency room entrance. “It can’t be him! We shared our bread in the morning.” She was led away as the crowd looked on in silence. EMIN SANSAR/ANADOLU AGENCY/GETTY IMAGESPeople check a list of the people who were injured in the blasts at the Ankara Numune hospital. Mevlut, a 30-year-old Turkish man, walked through the crowd outside the hospital with a plastic bag filled with 300 sandwiches he had bought for grieving and anxious relatives. “I’m just here to support,” he told The WorldPost, saying he planned to donate blood as soon as people were allowed into the hospital. 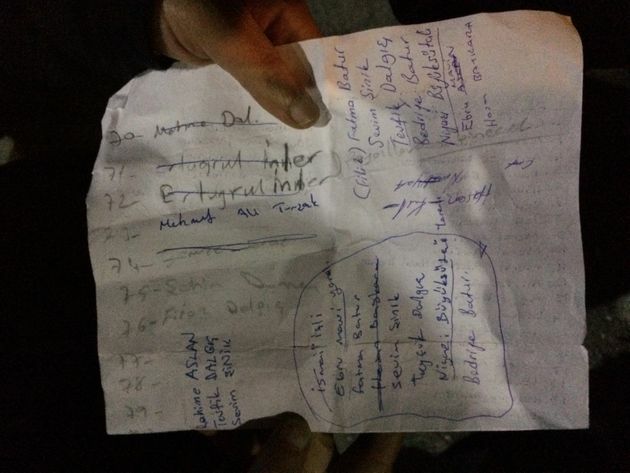 Another woman held a crumpled sheet of paper with the names of six friends wounded in the blast. She told The WorldPost five of them were missing and one had died, before breaking down in tears, holding on to the paper tightly. 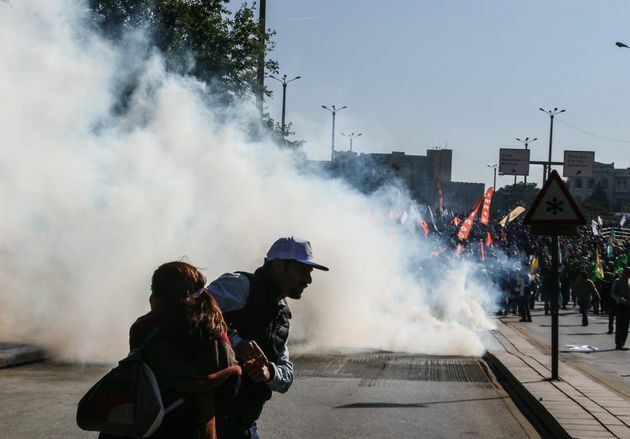 Demonstrations against the government and the attacks took place around the country throughout Saturday, Turkey’s Dogan news agency reported. The largest was in Istanbul, where some 10,000 people marched through the city to protest the explosions, according to Agence France-Presse. Some protesters held banners blaming the government for the bombings, the news agency said. BURHAN OZBILICI/ASSOCIATED PRESSBodies of victims are covered with flags and banners. Turkish authorities ordered a media blackout on images that showed the moment of the blasts, gruesome or bloody pictures or “images that create a feeling of panic.” A government spokesman warned news organizations they could face a “full blackout” if they did not comply. People across the country found themselves unable to use social media such as Twitter and Facebook Saturday evening. It was not clear if authorities had blocked access to the websites, but Turkey has frequently imposed blackouts after major events like terror attacks and public scandals. DEFNE KARADENIZ/GETTY IMAGESTurkish security forces use tear gas at the blast site in Ankara, Oct. 10, 2015.